In Latin ANIMA means soul. To animate is literally "to give life" to a character. Animating is moving something which can't move itself. Animation has evolved drastically from the cave walls of prehistoric times or the rubbery cartoons of the early twentieth century, to almost life-like computer generated graphics & animation of today. Why Animation/ Film making and Visual Effects? Every student, every parent, every guardian today is concerned about a strong career which can promise growth,stability,smooth,com fortable and high life style. They need a career course which should fit in their economy, ensuring them 100% job after course completion.Next important point is which else career option is there which is not considering only academic grade and percentage,as the only parameter to judge a student and his skills ! The answer to all this question is "Animation, VFX & Film making". It is surely economical compared to any other professional courses which leads to a successful career and a high lifestyle. This is the only career option where it does not matter whether a child has passed out with 35% marks or 90%. Even it allows a student to continue his graduation even if he has backlogs in 12th*. In this field story writing, story telling,observation skills, knowledge of proportion, artistic skills, mimicry, acting skills, colour concept, knowledge and interest in photography are considered as some of the important attributes which can lead one to build a strong career with fastest growth in this industry. Animation can be successful career for everybody almost. Normally a person with any skill inborn, find himself fit for one or the other domain in this industry. Animation just not promising you a strong and interesting career, practically it gives you opportunities TO LIVE YOUR DREAMS. It leads to creativity, beauty, and most importantly you get paid for your imagination. WHAT CAN BE A BETTER CAREER !!! Which are the application areas of Animation & Vfx? Animation and Vfx is inevitably being used in Entertainment Industry which includes Broadcast Media & Film, Advertising industry, Internet, Gaming, Education, Computer Based Training Applications, Architectural & Interior Designing, Fashion & Jewellery Designing, Product Designing, Medical Simulation, mobile application development etc. What are the salary levels that Animation & Vfx professionals get? Animation and Vfx professionals are in great demand. The average salary that a Multimedia professional gets to start with is around Rs.12000/- and goes multi fold depending on experience and skill sets. Salaries of artists in India have grown by 33% over the last three years. At the entry level, animators could earn between Rs.15000/- and Rs.35000 per month. Bangalore is one of the fastest growing cities in India. Prestigious studios like Dreamworks, which has only one branch in India, is in Bangalore. It is not the only one of its kind, also reputed companies like TATA Elexi, Technicolor, Dhruva interactive, xentrix, MPC are some of the world leaders having their studios in Bangalore. These are few among the giant players rather than that there are n-number of start-ups and mid level companies which are making Bangalore a heaven to numerous in this industry in regard of JOB openings Bangalore is the first city in India which has its own Animation Policy by the Govt.which shows the governments interest and support to this industry. How are the mentors' chosen by Aquariuss AIMS? 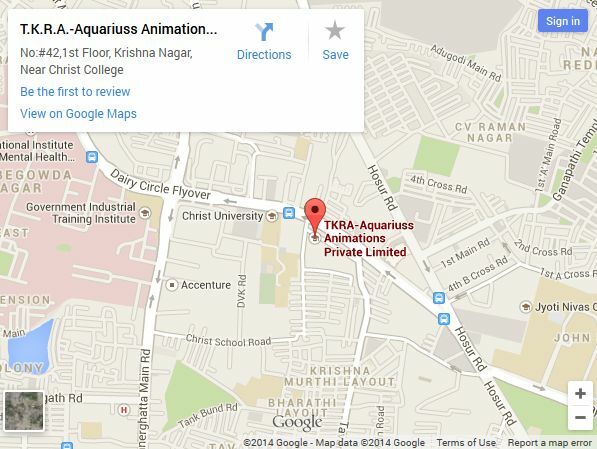 All faculties at Aquariuss Animations are handpicked with extensive practical industry experience and exposure. Selections of faculties are based on experience and passion for both teaching ability and production experience. They are among the best professionals having handled the key projects of Aquariuss Animations in various senior positions. Their exposure to the actual production process in terms of understating the requirement of the director, research & development, in depth subject knowledge, trouble shooting, and capacity to deliver superior quality adhering steep timelines is a value addition for any student pursuing our courses. We are providing you the best professionals as mentors to train and bring the best out of you. What are the studios Aquariuss AIMS provide for the placements? We have our own studio , so most of the students are placed in our own production house. Rather than that we even provide placements with the studios like Prime Focus, Rhythm & Hues, Prana Studio, Side FX Entertainment & Venus Animation, Darsh New Channel, Artoonz, 9 Miles, Affinity Express, Pixel Magic, Technicolor, Dhruva, Zvky, Xentrix studios Etc. What are the various JOB prospects after the successful completion of the course in Aquariuss AIMS? What are the placement options from Aquariuss AIMS? We provide 100% placement support to our student, also we directly recruit our own student to the production unit. Hence our students get an offer letter in hand even before they get their course completion certificate. Having our own Production unit, students get the opportunity to work on live projects with attractive stipends. What Aquariuss AIMS offer to students? Renowned BrandBest Course and ApprovalsWell experienced faculties and staff with year of production and academic experience, same team since the beginning, maintaining the stability and expertiseLocated at the heart of the city. 5 minutes walk from forum mall which is the most happening shopping mall of the cityBeing in the neighborhood of Christ University there are N-Number of ladies and gents PG's offering homely food and accommodation, ensuring comfort and security at both economic and luxury lifestyle. There is ladies PG at our same complex with 24 hrs security.